Horsham Bearings & Industrial Supplies - Tanks . . .
Horsham Bearings & Industrial supplies is your local supplier and installer of Rhino Water Tanks in Horsham and surrounding areas. 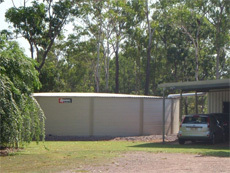 Rhino Water Tanks is a privately owned and operated Australian company with over 20 years experience in the water storage industry. 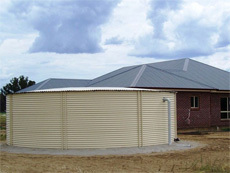 These modular steel tanks range in size from 26,000 Litres to in excess of 2,000,000 Litres and are available in Zincalume or the full range of Colorbond Â®. All tank components and the Hydrashield liner, are fabricated in the Western Australian factory, which means total quality control of every aspect of the tank manufacturing process is maintained. Hydrashield, a reinforced food grade Metallocene coated liner, is UV treated and suitable for exposed applications where a roof is not required. Rhino Tanks are ideal for drinking water and a range of other liquids including vegetable and animal oils, high or low pH water, sewerage, waste and recycled water. Rhino Water Tanks is a quality-endorsed company. 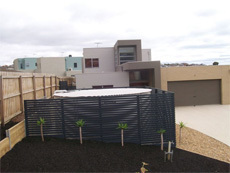 All products are manufactured in the Western Australian factory under a quality management system certified to ISO 9001. Rhinoâ€™s quality management system aims to benchmark our products and services against the best in the world and the well-recognised â€˜Five-Ticksâ€™ Standards Mark is proudly displayed to give customers the confidence that Rhino Water Tanks continually strives to provide cost effective, quality products and services that meet the customerâ€™s individual needs and expectations. 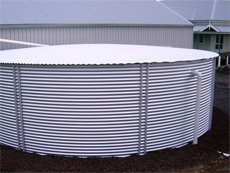 Tank liners are one of the most critical components of a water tank. They, more than anything else, ensure your water remains fresh, taste-free and completely safe from any contaminants. At Rhino we pay special attention to our tank liners. Rhino Tank Liners are fabricated in-house using a state-of-the-art material (Hydrashield), which was developed jointly with a Japanese manufacturer and Rhino Water Tanks. Rhino's range of Domestic & Rural Tanks are available in the sizes listed in the table below. 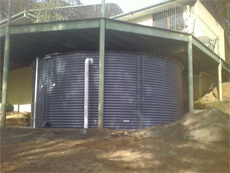 All tanks are 2.2 metres high and are available in Zincalume or the full range of genuine ColorbondÂ®. For tanks larger than 230,000 ltrs or for customised sizes, please contact us for specifications. 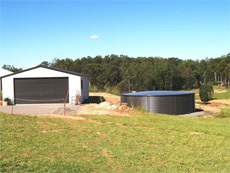 Rhino Water Tanks specialize in the manufacture of commercial corrugated tanks. 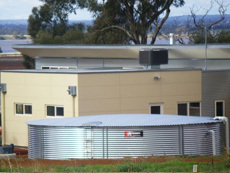 Engineered and manufactured to meet all Australian Tank Standards, the Rhino Commercial tank range is ideal for fire water storage, potable water, mine sites, water treatment plants or any project that requires large capacity water storage. 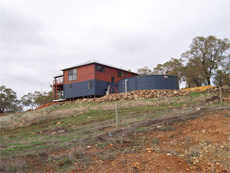 Tanks range in size from 26,000 litres to a 2.3 million litres and are available in Zincalume or the full range of Colorbond. 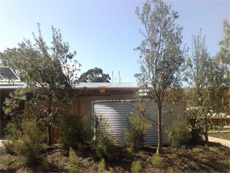 All corrugated wall sheets are rolled from Bluescope Steel and roof trusses are hot dipped galvanised for durability. Rhino's industrial strength reinforced Metallocene coated liners are UV treated, making them ideal for applications without a roof and can be used for a range of liquids including high or low pH and recycled water. Rhino Corrugated Commercial Tanks are available in a variety of standard sizes or can be custom designed to meet specific customer or project requirements. Our range of commercial tanks are available in 5 height specifications as shown below. Note: Effective capacities vary depending on tank dimensions & quantity, size & position of fittings. Rhino can custom design and manufacture commercial tanks to required dimensions up to 2.3 million litres.